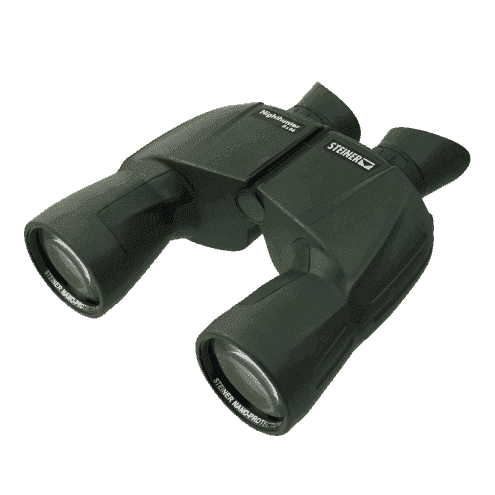 One of the newest additions to the Steiner stable is the large 8x56 mm Nighthunter binocular. Designed with hunting in mind, these binoculars will also be ideal for many other uses like birding and general wildlife observation and where an exceptional low light performance is required. Just like the windows in your house, their large 56mm lenses are able to capture far more light than your standard 42mm binocular. This combined with industry-leading anti-reflection coatings that are able to transmit more than 96% of light throughout the visible spectrum, ensures that the Nighthunter is able to deliver the brightest image possible even in the worst conditions. The moderate 8x magnification is ideal at short to medium ranges and also helps produce the extremely wide field of view you get on this instrument. For uses like hunting and birding in forests and at closer ranges, this is vital as it helps you to more easily locate and then follow small, fast-moving wildlife. When combined, the 8x power and the large 56mm objective lenses produce a massive 7mm exit pupil which ensures that your eyes are supplied with more than enough light, even in dark situations when your pupils have dilated. These binoculars use Porro inside to rectify the inverted image and as a result, the body has the typical “Porro Prism Shape” that is very comfortable to hold and because the lenses are further apart delivers a better stereoscopic image than most roof prism binoculars. The tradeoff to the larger lenses and Porro prism design is that you end up with a binocular that is both heavier and wider than your typical 8x42 and as such, these are not ideal for those who travel a lot or specifically require a lightweight instrument. Another important feature on the Nighthunter binocular is the use of Steiner’s Sports-Auto-Focus system. Once you have set each eyepiece to match that of your particular vision, no further focusing is necessary as these binocular have an incredibly long field of depth and as such everything from 20 meters away to infinity will remain in focus. Not having to use a focus wheel saves time and despite their larger size also makes them simple to use even with one hand, which if you are also carrying something like a bow or rifle can be extremely important. Note that the downside to the focus free system is the relatively long minimum focus distance that makes this binocular unsuitable for the study of things like butterflies from extremely close range. As is normal on their high-end products, Steiner has used their super tough and durable Macrolon housing. Completely sealed it is also pressure filled with Nitrogen gas ensuring that the Nighthuner is both watertight and fogproof. Steiner also adds tough Nano-Protection coatings on the exterior lenses which protect the surface and its hydrophobic properties ensure water simply rolls off them.